Bad news. I no longer have the coolest drone on the market. That’s because last week, DJI released two new Mavic 2 Pro drones: the Zoom and the Pro. There’s been a huge number of comments on these new offerings across the droning community for a while now, but no-one has actually had any hands-on experience with them, because… well.. obviously they weren’t available. Now they are, and obviously, one of the first to have one (or two) was Casey Neistat – a guy whose opinions on these sort of things I value tremendously. I started to watch his review with my Mavic 1 sitting next to me and an understanding that, inevitably, these new drones would render Florence pretty much defunct as the flagship, cutting edge consumer unit. tl;dw: unsurprisingly, two great drones. He prefers the one with the optical zoom (the… er… M2 Zoom), the other one (M2 Pro) is also good, but falls down a little on value for money. So yeah, my Mavic 1 is now old news. Because first off, there’s every reason for these models to be better than Florence. They have the benefit of being released 20 months later than her, and in a marketplace which features such cutting edge technology – technology that still regularly astounds people that see my drone – that’s a massive, massive advantage. Not least in that DJI can look at their consumers’ wishlists and react accordingly. They’re more expensive too. Sure, you’re getting a few more features, but aside from the improved cameras (and you can look at the video for direct side-by-side comparisons), there’s not really that much else added. The M2 Pro FlyMore package (the direct equivalent of how I bought Florence) comes in a cool R10,000 more than I paid for my Mavic back in January last year. And because of that, Casey suggests that for the quality of picture vs value for money, Florence can still hold her own against the M2 Pro. Boom. There are two other points to take into consideration as well, and these ones are personal, so I fully accept that they might not be the same for everyone. Firstly, if you are buying your Mavic 2 drone next month when they get to SA, then enjoy it. You’re going to have an amazing time. But you will have already missed out on the 20 months of fun that I have had. Sure, I could have waited for the Mavic 2, in much the same way that you could have waited for the Mavic 3. But I have had such a good time all over the world with my drone: I have no regrets whatsoever. And secondly, because money doesn’t grow on trees, my choice of which bits of technology I want to upgrade has to be tempered somewhat. Sure, if I won the lottery tomorrow I’d be at the DJI Store on Wednesday. But that’s (probably) not going to happen. A far more sensible approach is to wait until your technology begins to limit what you can – and what you want to – do with it. I’ve done that on a couple of occasions with cameras (indeed, I’m just beginning to get there with my current entry-level Canon DSLR). I’m nowhere near that point with my drone. I haven’t even scratched the surface. The problem is that it’s just such fun to fly. You head out with the best of intentions to shoot some amazing video or some such, you pop it up into the air and just “warm up” with a few runs in and out over the beach or wherever, and you’re having such a good time that you do a few more. Maybe that video thing can wait til tomorrow. And guess what happens tomorrow? I simply don’t have the discipline to overcome the amount of fun I have when I launch my drone. So, while my Florence is now technologically aeons behind in this exciting, fast-paced field, I’m very happy to keep working playing with my Mavic 1. It’s still amazing. It is. We leave Sun City today, after a whistle-stop 4-day, 3-night stay. Herewith a few (or more) thoughts on the last few days. In no particular order. Sun City isn’t my kind of place. On arrival, the guy at the gate asked if I had reservations. Jokes aside, it is a ghastly, hideous place. Faux opulence, faux history and gaudy buildings are the order of the day. It’s repulsive… and it’s also completely incredible. It’s Grand West on South Joburg steroids. The scale of the place and the attention to detail is amazing. It’s other-worldly. And The Palace Hotel (where we’re not staying, see below) is an absolute work of art. You might not like it, but you have to admire the place. And that’s the thing. If it’s not your thing, you need to get over it and just go with the flow and if you do, you’ll probably have a great time, like I did. Like we did. This was a last minute, unplanned trip. One we wouldn’t even have considered were it not for the free air tickets that came with our new fridge. We’ve already spent a bomb on our Europe trip later in the year, so economy was key here. We chose the Cabanas to stay in, to save a bit of money. It’s been small and not very luxurious, but it’s been somewhere to sleep – we’ve been out and about the rest of the time. The staff have been really helpful and are always smiling. That must take a lot of doing at the end of a long season. In fact, the only exception was a rude waitress at the posh hotel we had dinner at on Sunday night. She really did make an effort to be that exception though. Wow. The Valley of the Waves is a lot of fun. There’s something weird about watching a hundred-odd people standing chest-deep in an outdoor swimming pool, facing a wall and waiting for a single artificial wave every 10 minutes or so. But again, you join in and it’s kinda enjoyable. The tubes were great fun. I didn’t die on the Boomeranga ride, despite a couple of attempts. The bus service is either brilliant or disastrous. Possibly both simultaneously. We never really worked it out. Resort-wide free wifi actually works, and it’s literally everywhere: from our room to the beaches of the Valley to the Forest at the back of the fancy hotel. Incredible. We did a Family Safari Walk on our first morning. It was excellent. Zebras, Wildebees, Kudu and Impala and a lot of stuff you’d never have seen from a truck. The kids learned a lot. 10/10 would recommend. Sun City is massively incongruous in the North-West Province, which is like an Eastern Cape Lite. You pass Marikana on the way here. It’s a massive reminder of how unequal South Africa is. There’s water! I have had several long showers. You don’t realise how much you miss them. There was a bottle of wine for R130,000 on the wine list on Sunday evening. I need to enjoy our last morning before we head back to Lanseria and Cape Town, so I’ll leave it there. Photos will follow. Normal blog service will be resumed tomorrow. OK, so here it is. The thing which I was too tired to write last night. 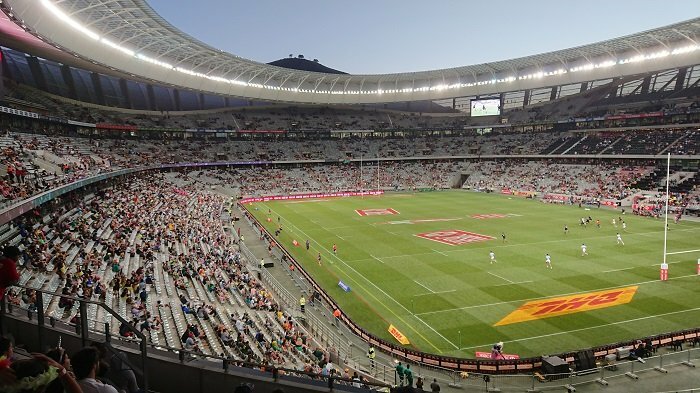 A quick run down of my experiences with my son at the Cape Town Sevens Finals Day yesterday. The parking: I’ve told you how to do this before, but ok, I’ll tell you again. You park at the CTICC (right hand lane off the elevated freeway, almost as if you were about to do a U-turn to go back out of town at Walter Sisulu) and walk through to the Civic Centre (it’s 900m, you’ll manage), from where you get the shuttle bus up to the stadium. On your return, you get the bus to Thibault Square, and walk down Lower Long to the CTICC (it’s 600m, you’ll be fine). The parking lot exits directly onto the elevated freeway, so no traffic problems at all. 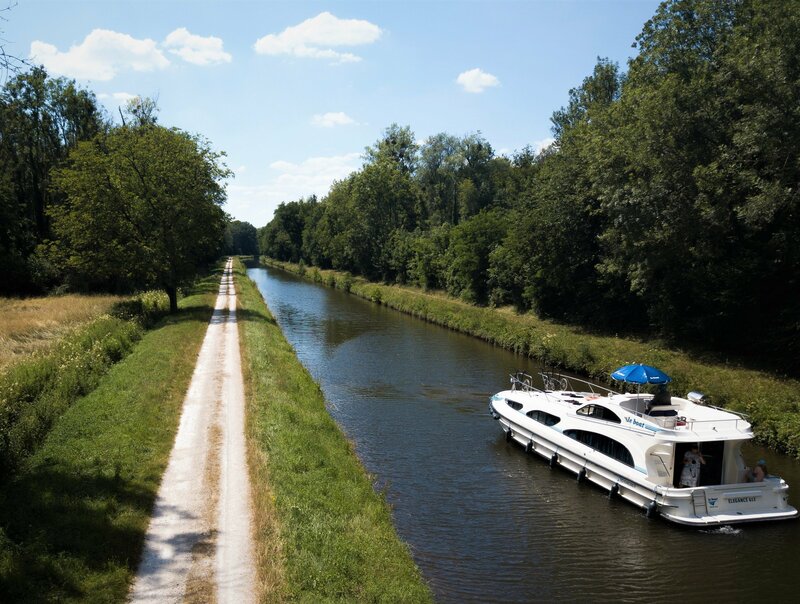 So it’s faster, cheaper and easier than the Waterfront. Or virtually anywhere else. The stadium: I’ve been to several concerts, many football and rugby events and precisely no happy-clappy religious gatherings at the stadium, and (without meaning to be negative) each of them has had their own little niggles. Not yesterday. The experience was flawless. Friendly staff, little (or no) queuing for refreshments (including at the bars), a wide variety of foods, lots of activities and freebies for the kids. Brilliant. The entertainment: Lots going on between the games kept us interested. Dancing, music, beagle herding, enthusiastic MCs. The highlight for us (and many others, I suspect) was the “Rugby Skills” competition for a few happily inebriated fans towards the end. Very funny and very well managed. The rugby: It was good fun and played in good spirit, as it should be. England were in self-destruct mode, New Zealand were in we’re-out-to-shock-the-opposition mode, the USA was basically just speed and muscle and the Fijians were just muscle. And then there was the Blitzbokke, who were clear favourites for the win. But that didn’t happen, which brings me to my final point. The crowd: Oh dear. I’m going to get into trouble for writing this, but that’s rarely stopped me before, so here goes. 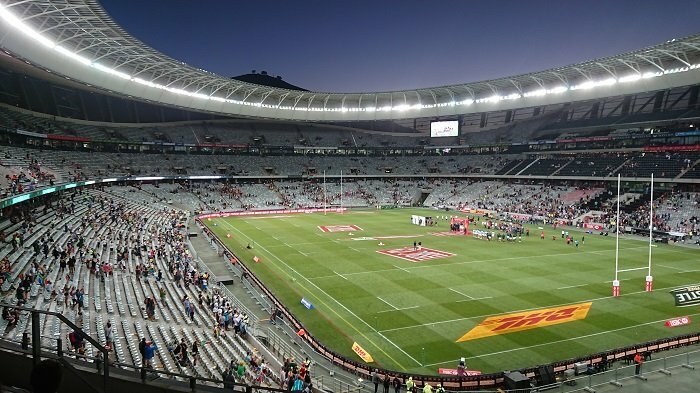 We’re repeatedly told that Cape Town is the “best” leg of the 7s. I don’t know how they work these sort of things out – hey, maybe they tell everyone that their event is the best. That would be a bit naughty, but then, people are a bit naughty sometimes. The thing is, if this alleged optimal status has really been bestowed upon Cape Town’s event, then it must surely only be for the fancy dress and the partying. Because yes, Cape Town does do the fancy dress and the partying very well. When it comes to actually supporting the rugby though, the fans are fickle and fairweather (OMG, he said it! And now see how the hordes are gathering their flaming torches and pitchforks! OMG! I can’t bear to watch!). I took a few pics to illustrate my point. Either a shedload of fans couldn’t actually be bothered any more, or else they had turned up in grey plastic seat fancy dress. South African sports fans are notoriously fickle and fair-weather. We knew this already. 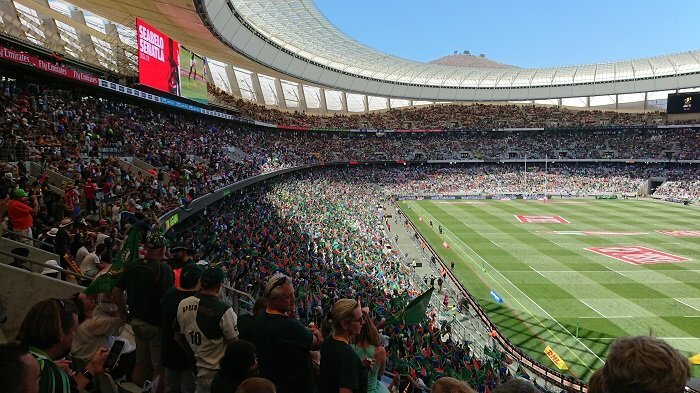 Comparing photos one and two above, indicates those fickle fans who came to see South Africa win, versus those real fans who came to see South Africa play. I don’t know if this happens at every 7s event. Do Australian fans leave once their team has been beaten once in Sydney? Is the same in England, Scotland, New Zealand, Canada and the USA? And if it is, does anyone even bother to turn up to watch in Dubai and Singapore? There were very few people in the stands to see Wales v Russia, because it’s a meh game between two sides who lost a lot on Day 1 – well, ok. Equally though, that won’t be replayed all around the rugby-playing world. The final (and the trophy presentation thereafter, will). It’s not a great advert for the event when it’s being played (or presented) in front of tens of thousands of empty seats. And yet we all cried about not getting the Rugby World Cup in 2023. 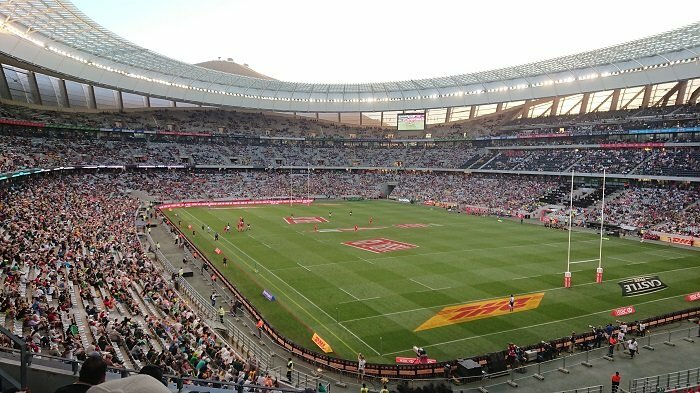 That said, the spin is obviously good, because (as I may have mentioned earlier) Cape Town was voted the Best 7s Event on the Tour. So, all in all, I think it shows a complete lack of manners and it really doesn’t look great on the international stage, but hey – it’s a free country (well, sort of, anyway). I’m not saying that you have to stay until the end. You’re free to leave when you want. Equally, I’m free to pass comment on you leaving when you want, you disrespectful, fair-weather, part-time, so-called rugby supporters. Boy away on school camp. Girl takes full advantage of parents’ undivided attention, asks if we can do dinner. Dad reads the small print. Never read the small print. We hereby respectfully advise that gratuity is not included in our main prices. The norm for good service is 100% of the total bill. The payment of gratuity is entirely voluntary and the amount is based on the quality of service. Did I miss something here? Not since the Waterfront branch of Cape Town Fish Market conveniently informed tourists that ‘in South Africa, we routinely tip twenty percent’ has there been such a blatant attempt to rip restaurant patrons off. But even the pisspoor CTFM kept it vaguely reasonable. This is completely off the scale. And at a restaurant where a 3 course meal plus wine will set you back ±R400 per person, it’s no wonder that the parking lot is full of Audis and Beemers – that’s clearly how the waiting staff get to and from work.